Tornik LLC & EMS Mexico, a contract manufacturer of custom electromechanical assemblies, has successfully completed the three year ISO 9001 re-certification process. To become ISO 9001 certified, a company must fulfill requirements outlined by the International Standardization Organization (ISO). Specifically, ISO 9001 requires an organization to demonstrate a quality management system with the ability to consistently provide product that meets customer as well as statutory and regulatory requirements. An ISO 9001 certification is verification that an organization is committed to enhancing customer satisfaction through the application of the management system, with processes for continual improvement and the quality assurance in place. Through the dedication of our staff, both in East Hartford, CT and Tijuana, MX, Tornik LLC continues to provide 100% computerized tested assemblies to our customers. 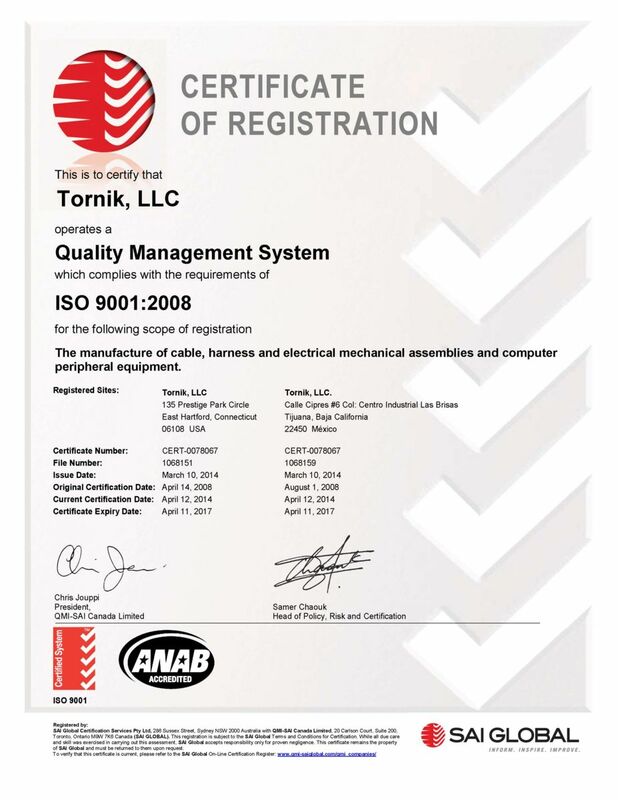 Tornik has been an ISO 9001 certified company since 2001, with our most current certification being ISO 9001-2008. Tornik is proud to be able to offer customers quality assurance through continued improvement.